Cloth Dolls… I’ve made cloth dolls for decades, it's something I used to turn to when I had a bit of a creative block with my art… after studying fashion design for three years I gave up on the dream of a career in the creative industry…little did I know I would have the chance to rekindle my artistic flair & start all over again. As a mixed media artist I enjoy the challenge of all mediums, I’ve always been drawn to textiles, especially the chance to breath new life into old, unwanted or surplus fabrics. 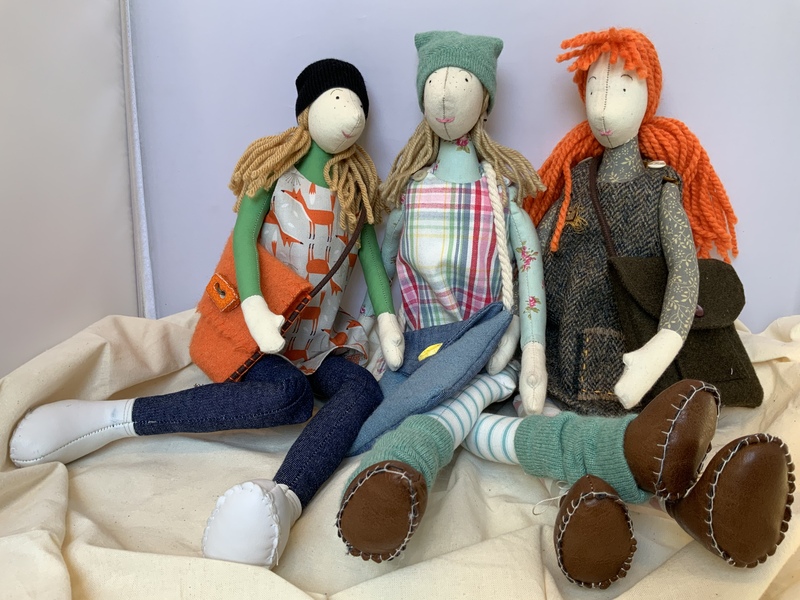 My ideas initially came from an idea to help students on work experience & then comforting a child of a lost parent, my Cloth Dolls have evolved & progressed… original, characterful personalities are what inspire me, we’re all unique so, like ourselves, no dolls are the same. Handmade Heirlooms Original Cloth Dolls. “The view out of “The Fyndings” front door is simply the best, actually, probably the best for miles around. Perched at the top of the small narrow village the front door opens out to the most picturesque vision…quaint little cottages line a narrow road with wild flowers & the odd picket fence…& a couple of stray hens for authenticity!... To the left a sweeping patchwork of green, brown & yellow fields hemmed neatly by dry-stone walls, in the distance, roof tops & chimneys of the nearest town can be spotted peeping through a small forest alongside hints of moorland, their hues of purple & rusts glowing lazily on the horizon….to the right, passing the old lime tree that shelters the nests of turtle doves, a farm track leads through some soft yellow square fields of wheat & corn, that gently slope towards the cliff top…"